Open the bottle night was on February 25th. David of Cooking Chat invited us all to open that bottle of wine that we have been hoarding for a special day. Sometimes you just have to celebrate for the sake of celebrating and that is what OTBN is all about. You can learn more at David's preview post. 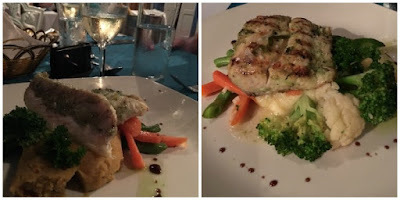 It just so happens that February 25th was our first night having dinner during our dive vacation in Dominica. We had actually arrived late evening the night before but it followed a full day of travel and we were given a BBQ and Rum Punches upon our arrival. We had gotten up and had two wonderful dives in the morning and then just kind of lounged around recuperating until dinner time. 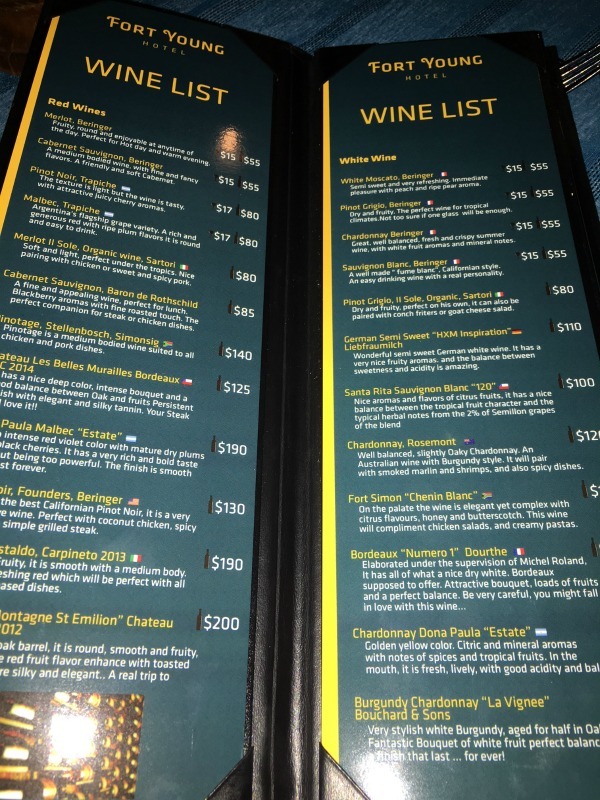 When we went up to dinner we requested the wine list. It was a short list but it did have a white bordeaux that I wanted to try. However, it was listed at nearly $200 and I didn't want to blow my travel budget on the first night. 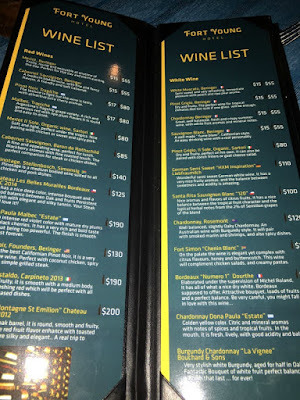 The only reasonable bottles were Beringer wines at $55, which I still thought was outrageous. I did want to partake in OTBN though so we ordered up a bottle of Beringer Chardonnay to pair with our dinner. We drink Beringer wines at home as an everyday wine so it isn't really what I would have chosen for OTBN had I been home in front of my wine fridge but it was still a special bottle since it was part of a wonderful dinner and vacation. I am very excited to see what bottles the others chose to open. I am sure to find some bottles to put onto my wish list. C'mon you can come with me to the other links. No blog post about #OTBN, no worries! You can still join the conversation about Open That Bottle Night Pairings by joining our live Twitter Chat on Saturday, March 11. Simply tune into the #winePW hashtag on Twitter at 11 a.m. ET / 8 a.m. PT on 3/11 and join the conversation. 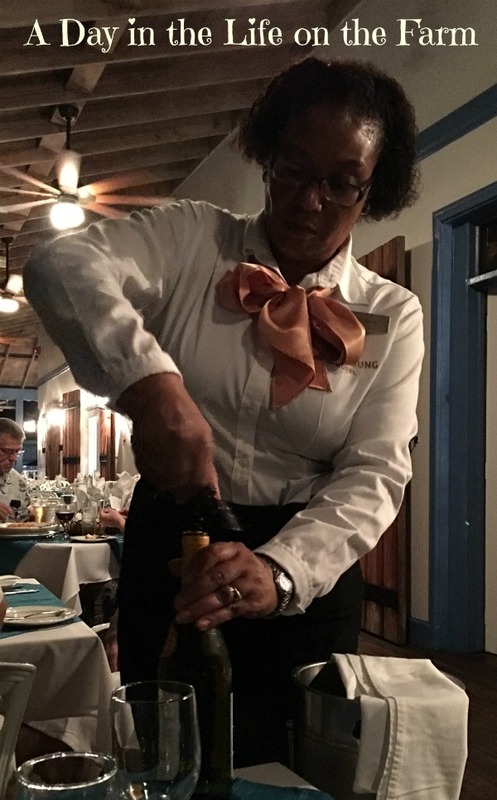 Please also make plans to join us for the April Wine Pairing Weekend event, when I will be hosting on the topic of “My Old Standby” on April 8. You can get a list of all the past and upcoming #winePW events by visiting the Wine Pairing Weekend page. Ha! I've done the same thing. Not realizing the cost was not in US dollars. It can be quite the sticker shock until you catch on! Mike and I love to dive also! One of my great pleasures in life...that and wine, of course. I was hoping to get by your winery in January while visiting at my brothers but it didn't work out. Next visit you will be high on my list of priorities. How fun to celebrate #OTBN in the Dominican Republic! That would be fun too. I haven't yet been to the Dominican Republic but it is on my list. Dominica is a country that was once under British and then, French rule but now is governed on it's own. I love your determination to celebrate OTBN! Congratulation on improvising and making it work. The Chard and Lionfish sounds like a wonderful pairing! It was Martin. I love lionfish. What a fun night during your vacation!! And the price anecdote-so funny! Cheers to you for persevering! I was doing that low, slow whistle when you gave the cost of the bottles of wine. I know that is WAY out of my budget. And then I was thinking, "wait I wonder if that is US prices". I'm glad you found that out!! Sounds like good wine no matter how you price it!! Yes but I was very relieved to know they were EC dollars or it would have been a very expensive trip. Nice effort to participate while away on vacation! Thanks David and thanks for hosting.